Residents, with the guidance of the Chesterfield County planning staff, are in the third turn and heading for home supporting a vision that could guide the Northern Jefferson Davis area into the future. The area has many challenges and therefore the draft plan has had its challenges as well. Yet challenges come with opportunities, but solutions can be more difficult to define and take some time for agree on their vision. Those who attended meetings during information gathering by the planning staff discovered that comprehensive planning is a process that determines community goals and aspirations in terms of community development or how residents could see their community in the future and, in Chesterfield’s case, the entire county. The outcome of comprehensive planning is the comprehensive plan, which dictates public policy in terms of transportation, utilities, land use, recreation, and housing. The plan covers the entire county, and then i smaller plans (special area plans) are studied and overlaid on the larger plan, typically where populations are higher. The introduction to the draft plan describes its footprint: The Northern Jefferson Davis Special Area Plan includes about 13.5 square miles. It is centered on an 8.5 mile segment of Jefferson Davis Highway. This highway provides the backbone of the community’s numerous and diverse neighborhoods, development patterns and cultural, historic, and economic interests. The last comprehensive plan for the area was competed in 1993. The plan served the area well until it became outdated as the countywide comprehensive plan was approved. 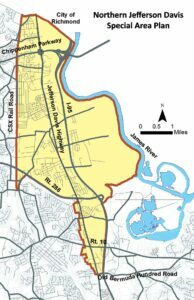 Called the Northern Jefferson Davis Corridor Special Area Plan C, the plan has been reviewed at various public meetings since over the last two years. What is a comprehensive plan? First, it is mandated by the Commonwealth of Virgina, and second, it manages how growth will take place in your community – how land is used. A resident would not want a McDonald’s or a factory built right next to his home. “Our citizens had many concerns, of course, which we have tried to address through this plan amendment,” Bolling said. “The biggest concerns I think are to see reinvestment in the area, both public and private, and efforts to continue improving the health, safety, welfare and prosperity of the community.” Residents, with the guidance of the Chesterfield County planning staff, are in the third turn and heading for home supporting a vision that could guide the Northern Jefferson Davis area into the future.